Most editorial teams employ basic keyword research tactics as part of their daily routine, such as using keyword tools to refine word choice or monitoring trending topics for real-time opportunities. But what about using search and social data to influence the editorial calendar over the longer term? Mining keyword research, analytics and competitive data to identify new evergreen content opportunities does not always get the attention it deserves from busy editorial teams, despite this being an area with considerable upside for publishers. To help with that I’ve outlined a basic workflow for using keyword research for editorial content planning. It can be focused on a limited number of priority topics or applied on a larger scale, essentially mapping out a site’s entire universe of coverage. To be clear the aim here is not to encourage sites to create content solely for SEO, or to take things to a content farm-like extreme. But allowing search and social data to influence (not dictate) the editorial calendar and content planning process can reap significant benefits for traffic and audience development. I also want to emphasize that this workflow is geared towards editorial teams at news and content sites that publish a steady stream of content in various forms. They are always looking for new content ideas and insights into what topics and terms to pursue, but they don’t have the time (or frankly the interest) in pursuing advanced keyword research techniques. So this workflow is simple and straightforward by design. For businesses engaging in content marketing a more in-depth research and planning process is usually required, as content is often produced on a smaller scale and potentially with higher stakes. For a more intensive approach check out a great piece that Stephanie Chang wrote called How to Build a Content Marketing Strategy. The overall idea is to start fairly broad and then get progressively more focused. A top-level topic on a food site might be something like barbecue. The main categories within that topic would be things like grills, tools, techniques, recipes, sauces, marinades, etc. Then the “clusters” within each category are essentially the root phrases that you’ll use to research specific keyword targets. So drilling down on barbecue sauces, for example, would lead to clusters like “barbecue sauce recipes”, “how to make barbecue sauce”, “homemade barbecue sauce”, etc. Finally, researching the potential target phrases within a cluster will lead to candidates like “best homemade barbecue sauce,” “easy homemade barbecue sauce,” “how to make homemade barbecue sauce,” etc. Steps 1-3 are best accomplished through a mix of institutional knowledge, brainstorming, keyword and trend tools and competitor research. These three steps will provide a wide range of new content ideas. Then the remaining steps will allow you to focus in on the specific keyword targets for each. Compare the search volume for potential target phrases within each cluster. 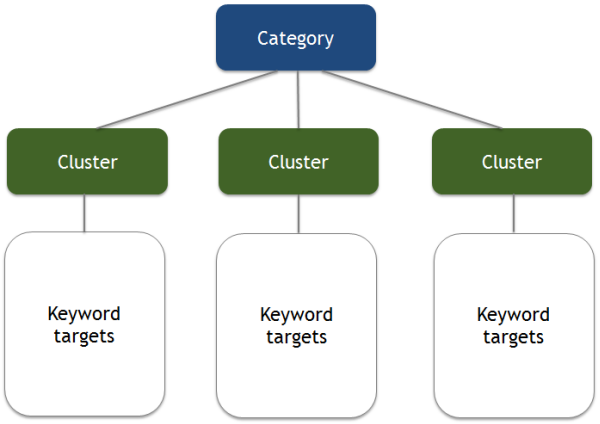 Evaluate further by examining keyword difficulty and doing some basic competitive analysis. Weed out things that are not a good match editorially, and those with a different intent (such as queries that are more transactional than informational). This will leave you with a decent list of keyword candidates. Determine what has already been covered and how well the existing content is performing. Also look at how much search traffic the site is currently getting for the candidates and/or similar phrases. Once you know what you want to go after, it’s just a matter of blending the new content ideas into the editorial calendar throughout the year. Or consider creating special projects to build out content in specific areas over time. This process seems pretty simple and straightforward, and it is. But it is important to point out that in practical application keyword research for content planning takes a lot of time and effort. So pace yourself and avoid overdoing it. The editorial team is your best resource. They are the subject matter experts and can do a fair amount of this based solely on their knowledge and experience. Keyword research is more art than science. The data will guide you but it is the human element that makes the process work. There is rarely a 100% “right” answer. It often comes down to a judgment call based on feels right based on areas of coverage and editorial voice. It is not possible to create a definitive list in any category or cluster. So don’t get carried away; find some good opportunities and run with it. You want to make sure that the keywords you select are relevant, match the content on your page, and are unique enough to drive traffic to said page. In order to do so, you need to review the content on the page and integrate the keywords appropriately. This is definitely something a human needs to do, to make sure the keywords integrate seamlessly with the page.